“A wall bracket is a wall bracket”. As my ex-boss used to pronounce, “If you say so Old Boy, I`m sure you must be right” (accompanied with the merest suggestion of sarcasm............). How much should I pay for an aerial installation ? Well this is actually quite a big question. I`m told that "darn London mate" things are more expensive, though I can`t really see why it should be that much more to fit an aerial. Maybe the installers think they should be earning as much as "them in the City" ? On the other hand I sometimes hear unbelievably low quotes as well, though I find it hard to believe they`re for a complete aerial installation using quality components. 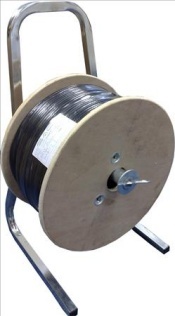 You must remember that the best quality cable, brackets, poles & aerials, cost 2 or 3 times as much as the cheapest. There may, quite reasonably, be extra charges if the installer has to drive some distance to site, or he has to come back because he can`t do the job for some reason, e.g. your rose bush is right in the way of where he needs to put his ladders. Bear in mind that aerial installers haven`t got flying carpets, for example, how are they supposed to get to a wall above a conservatory (to either mount the aerial or run a cable) ? Most aerial installers don`t like working inside (cable runs etc) because that`s a classic area for problems as to what "looks nice", or is even possible at all. Nearly all aerials or extensions will be to an outside wall, if you want it to an inside wall I`d install that bit of cabling yourself for the installer to join on to. Anyway, for a decent quality aerial installation (everything new, including decent cable), on a standard size two storey house, to one point [no wall plate], I`d have thought £100 to £130 would be fair, possibly a bit more for an install on a chimney. If an amp is required that`d put the price up by £20 to £30, and awkward cable runs and/or access problems would also be more. Nightmare jobs (requiring time consuming aerial positioning tests etc) would, rightly, put up the price, maybe by a considerable amount depending how long it takes, though the installer should keep you aware of any potential increase in costs if he hits problems. This is why there are certain circumstances where an informed DIYer may actually stand a better chance of getting reasonable reception. Getting an aerial installer out to repair an aerial is usually a false economy because, if you think about it, the installer coming round to your house and getting on your roof is half the job ! In fact a repair is usually more then half the price of a complete replacement. The price of an aerial extension from your existing aerial (not to a wall plate) would usually be £50 to £60, a bit more if an awkward cable run or an amp is required. Extra aerial points put in at the same time as an aerial installation would usually be a bit cheaper because the installer is already on site with all his ladders and tools out. Site surveys / set ups / retunes £30 to £40, assuming they can be done in under half an hour and the installer hasn`t had to come too far. Setting up one TV would normally be included in the price of an aerial installation (or each aerial extension), but if the installer changes the aerial on a distribution system it`s not reasonable to expect him to retune every single TV [connected to that aerial] for no extra money ! 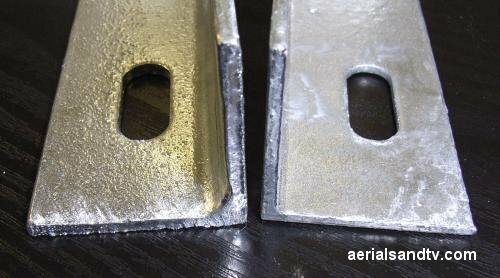 These two models of 18” T & K brackets are ostensibly the same but the one on the left has metal 3.2mm thick (average) whereas the one on the right is only 2.7mm. We sell the product on the left….. Also see bracket tests. We give a lifetime warranty with any bracket we sell ! Problems When Ordering Online ? Problems with “slippage” when viewing this site ? It has come to my attention that some of you out there think this site has an abundance of amusing anecdotes on it. Some of you spend far too long on this site just for amusement. I would ask, nay demand, a termination of this tremendously tiresome tittering. May I remind you that you are with this establishment to learn. If any of the above comments apply to you I would suggest you take advantage of the following list of the more amusing jokettes and then leave this site immediately, so your classmates can concentrate on their studies in peace. Shut the door on your way out. "What has this got to do with aerial sales ?" Well I think it goes some way to explain why we only sell QUALITY stock. I love well engineered products and I can`t stand cheap rubbish, particularly when any price difference is so small compared with the cost of the average TV. 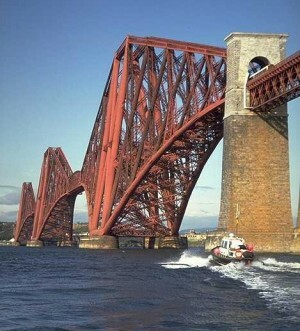 * The huge 10 year job of repainting the bridge with 240 000 litres of "high tech" epoxy glass paint was finally completed in December 2011. The paint is reputed to last 20 years, so simple subtraction hints at the fact the job won`t require doing again for about 10 years. The Ultimate In Secure Purchasing ! ! ! it`s all on paper, no bleedin` hacker can possibly get your details ! Our prices for some products are a little less than some suppliers and a little more for some others, though this does not always take into account the differences in quality. All our prices include VAT and small orders can sometimes pay less P&P. What I can never understand about people is that some of us never seem to value our time as we do at, say, work. Let me give an example. I go swimming about three times per week and those infernal coin operated lockers regularly fail and keep ones 50p. I used to go back out to the kiosk and summon the attendant to retrieve my money until I realised this was crazy..... If it took 10 minutes to sort out, that`s only 3 (three) pounds an hour ! In fact if everything went really smoothly, and it was resolved in five minutes flat, that`s still only £6 per hour. I`m in the fortunate position that I wouldn`t work for £6 per hour and my free time is definitely worth more than that to me. These days I simply chalk "U/S" on the locker (to save others the same problem) and write off the bleedin` 50p. All very rational, so why do some people spend an hour or more scouring the internet to save £5 ? Even then they may well not get the same quality of product, even if they do they probably won`t get the same quality of service, and even if they get that as well, is that really worth £5 an hour ? But wherever you decide to shop, play fair, spend your money where you get your information…. also on the Sales / Mail Order and the Poles & Masts page ! Nothing shows so vividly the differing qualities of materials used in this trade. On the right is a 1” steel pole. Remember this was originally galvanised, although as we have already seen it was only “Pre-Galv”. If one looks carefully one can see where the wall became so thin that eventually the pole snapped in the wind. This is the only type we sell / install. In normal usage it will never fail. Note our lifetime warranty on the poles we stock ! When the WEEE (Waste Electrical & Electronic Equipment) directive was first mooted I thought it was a good idea. I had hoped that the added cost (required for compliance) would encourage consumers to repair [i.e. genuinely recycle] products and that the directive would motivate manufacturers to make their products more repairable. Unfortunately the WEEE does not seem to have had either of the above effects, though to be fair the manufacturers are now responsible for the disposal of waste. As an aside it does make me smile that so many people collect all their waste paper to be environmentally friendly, and then change their TV every few years ! The Waste Electrical and Electronic Equipment (WEEE) Directive is now UK law. The legislation aims to make producers pay for the collection, treatment and recovery of waste electrical equipment. The regulations also mean that suppliers of equipment like high street shops and internet retailers must allow consumers to return their waste equipment free of charge. If this service is required the customer must send back the old product (by second class post) and the cost of this will be refunded to them, please contact ATV before dispatching the product. 1 Much of the UK’s WEEE ends up in landfill, where the lead and other toxins it contains can cause soil and water contamination. This can have a harmful effect on natural habitat, wildlife and also human health. 2 Many electrical items that we throw away can be repaired or recycled. Recycling items helps to save our natural finite resources and also reduces the environmental and health risks associated with sending electrical goods to landfill. ATV are obliged under these regulations to offer their customers free take-back of their WEEE on a like-for-like basis when they buy a new Electrical or Electronic product from them. 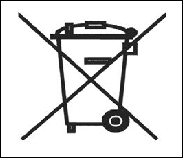 For example, if a customer bought a new aerial amplifier from ATV they would accept their old aerial amplifier and prevent it going into a landfill site by disposing of it safely. Customers must return their WEEE item to them within 28 days of purchasing their new item. I know what you`re thinking, “Good Lord, what a website this is, it even tells you about fence posts, it`ll be revealing the meaning of life next”. The answer to the latter is effort by the way but back to fence posts. I would only ever use 3 inch fence posts for a small fence in a sheltered area, what you should be using are the 4 inch variety. Partly because one should always do a Quality Job (and have some pride in it.....), but also because its usually cheaper in the long run anyway ! Now the strength of a post is down to its cross sectional area, that is to say a 3” variety would be 3 x 3 = 9 square inches. Add in half an inch of rot to the equation and we get about 2.5 x 2.5 = approx 6 sq in. Compare that to a 4 inch fence post which is 4 x 4 = 16 sq ins, or about 12 sq ins if some rot has weakened it. The point of all of this is that a 4” post is not just 33% stronger than a 3” one, it`s nearly twice as strong. In fact if you add in half an inch of rot, it actually has got twice the strength ! The price difference on the job, whether you DIY or GSI* is not worth bothering with, and you get a fence which is TWICE as strong ! You know it makes sense, just like our 1.25” x 16 gauge aerial poles ! It`s actually an even worse idea because not only does the bearing make the product a pain in the arse to use but it also makes the holder more expensive to manufacture and makes it weaker, which we discovered when one of the spindles snapped off. I was so offended by this appalling piece of design that I took the trouble to phone the manufacturer about it. Yes, you`ve got it, that immortal phrase, “no one has ever complained before (so it`s fine)”. So let`s get this right, no one has ever complained about a product which, when you think about it, is patently useless in every possible way. * Since I got my "low water use toilet" it`s made me realise what it must have been like for a bomb aimer crewing a Lancaster in the war. Right chaps we`re about to commence our bombing run over the target area, we`ve come all this way so let`s make it a good one, let`s drop it right in the drink. Over to you Paddy. OK Skip.....left a bit........right a bit.........steady......steady......right a bit....... steady.......Bombs gone ! Top show chaps ! Bang on target ! Splashdown ! Navigator, plot a course for home ! As a general principle there`s nothing wrong with complaining, particularly if your complaint is constructive. Well run companies are only too pleased when customers point out to them where they`re going wrong, or better still, how they could do it better. In fact Albert Speer * was quoted as saying that complaining is a valuable process for encouraging efficiency and the fact so few people complained in Nazi Germany was a weakness as compared to the democracies. Hopefully you have found this website informative and have learnt a little, or a lot, from it. What`s more important hopefully you`ve had a bit of a laugh as well. Whenever my wife fails to laugh at one of my cracks I tell her my readers find me amusing, she just responds "but they don`t have to live with you !" I`ve no idea what she means, could it be I suffer from RJS (Repetitive Joke Syndrome) ? If you think that others may also find the site of interest, please help to increase the number of visitors to it, metion us on as many forums and other forms of social meia as possible ! Alternatively, most people find this site from search engines, and the higher a site is ranked on those search engines the more people click on to it. Now the single most important factor affecting a sites ranking is the number of links onto it, and that`s where you can help, a lot. We`d be grateful for any link onto this website from any other website, e.g. your own website, or a Forum, or a Blog (not that I really know what one of those is.....) or whatever. Lastly, how about putting some reviews of us on the relevant sites ? Google reviews would probably be most helpful but there`s also Trustpilot and others. I`ve got to say I don`t particularly like dealing with tradesmen. Apart from concern whether they actually do a good job, or overcharge you, the most annoying thing is that most of them never seem that bothered whether they get the business or not, builders and plumbers being the worst offenders in that regard I think. In fact many of the jobs I do round my own house I would actually get someone in to do if I could be sure they`d turn up when they say they will, do a good job, for a fair price, reasonably quickly, and (even moderately) enthusiastically ! You know what I mean...... If you know any who fulfil the above criteria, stick with them, and, if they`re in the Sheffield area, please give me their phone numbers ! We regularly get people phoning us from all over the country wanting us to undertake an aerial installation for them but, unfortunately, we only work in the vicinity of Sheffield. The next question is can we recommend anyone, and again the answer is no, but here is some guidance in how to find an installer locally. Does your prospective installer use steel (or 1" alloy) poles and/or Contract aerials and/or painted brackets ? That`s always a bad sign because it proves they`re using the cheapest possible materials. On a positive note if they use Log Periodic aerials that`s a good sign, as is use of copper/copper satellite cable. There`s not that many installers (5 to 10% ? ) who use the latter because it`s quite expensive, so if the installer you`re considering does use it that`s a very good indication they do a professional job. Don`t forget to use the information on this website to check up on the installer (and the job), but don`t go on at them too long (or make it too obvious) because that`ll just annoy them ! Obviously the best way to find any tradesman is by personal recommendation but this is not cast iron as aerial jobs can be so different. The recommended installer could have done a job for someone who lives in a strong signal area, were anyone with half a brain would get "perfect pictures", even by indulging in some Bertie Bodging. I have to say, and I speak from experience, personal recommendation doesn`t always work anyway. A tradesman was glowingly recommended to me by a neighbour, his job was cheap but it was a bit of a bodge and it was difficult getting him back to rectify a problem. And he wanted paying cash, I didn`t oblige (I never pay tradesmen in cash), but it was a bit of an awkward situation. I find that Church / Parish magazines are a good source of tradesman, not least because the Vicar may well remove adverts from traders that have been the subject of complaints ! 1 Try and use someone with a local telephone number and preferably not just a mobile as the latter can be ignored if they don`t want to talk to you, and they`re more expensive obviously ! Avoid Freephone numbers, apart from being "non local" my experience is that companies using them are often more expensive in the end. On the subject of Freephone numbers many of them (though not all) go to a central agency which then gives the job out to another company for a commission. I`ve got to tell you this fabulous story I heard from one of our customers. He phoned an 0800 number and two installers turned up within 5 minutes of each other, and then started arguing as to who should do the job ! I`m sure that`s a rare occurrence, but even so, how fantastic is that ! 2 It`s definitely a good idea to use someone with (local) business premises, if you can, because it`s so much easier to get hold of them, they can`t just ignore you if you have a problem. Alternatively make sure the installer put`s their address on the advert, and make sure it`s a genuine one, not just a misleading "geographical reference point". Beware of Nationwide companies who are not local to you (they often just sub contract the work out) and many use multiple company names all going to the same call centre. 3 I think it`s good practice to go for companies with medium size adverts, big enough to convey information and suggest they`re established, but not too expensive to put in. After all, you`re the one whose paying for it, one way or another. 4 Watch for firms which use .....00000AAAAA prefixes to their company name(s) in order to improve their alphabetical ranking. You`ll usually find these pseudonyms in some obscure place on the advert. Trying to find them make`s for an amusing parlour game, hours of fun, and the kids can play too ! I know the publishers should ban it, but at the end of the day they`re not bothered so long as the advertiser pays the bill ! Personally I can`t abide anything which isn`t "up front", and this isn`t, so what does using this kind of subterfuge say about the attitude of the trader ? 6 Try to get a few quotes over the phone but remember they can only be ball park figures. Avoid the temptation to go for the cheapest, unless you know for a fact that they`re reputable and they do a good quality job. NOTE : Our Online shopping page is hosted at PayPal (though you can still pay by card, you do not need to have a PayPal account), problems with the Online ordering are usually down to them. Those using a PayPal account are implored to check your address is up to date, or the order will get delivered to your old house ! ! ! First try a different browser. I normally use Internet Explorer but if I ever have a problem with a website I have Google Chrome on my PC and I try that. Often a website which is problematic on IE will be OK on Chrome. Try a “hard reset” of your PC, i.e. turning it off and on again ! Try checking the security settings on your computer if you find that the PayPal order page is not behaving as it should, e.g it will only allow you to order one item. We experienced the latter problem on both our PCs, even though we hadn`t altered anything ! There are two approaches, when on the “shopping cart page” just open a new window and add what you want on there, you`ll usually find a new basket will appear with both (or all) the items in it. Alternatively, those helpful chaps at Very PC suggested we try the reset procedure outlined below, and it worked. In fact experiments on both PCs indicated that this was definitely the problem. If still having problems with Online ordering there is a 100% cure, phone us up with the order and pay by card ! Problems With “Slippage” On The Website ? This website is optimised for display at 96 DPI screen resolution and some monitors set to 120 DPI may suffer from “slippage” problems of the pictures / text. If the “General window is displayed here click Yes. For the settings to take effect you must restart your computer. If you want to reset your resolution back to 120 DPI repeat the above but select 120 DPI at the relevant point. My thanks to Michael Slattery for discovering this problem. From January 2012 I`ve started adding "Auto Scroll" to the text boxes so all content should be readable one way or the other. Use of the scroll bars should be particularly helpful to readers from abroad using Google Translate. Additionally some browsers (e.g. Firefox) will only print out the first page for some reason, the others are blank, Internet Explorer is usually OK though. In fact this site is optimised for IE all ways up. I would personally like to thank our readers who`ve tried to help me sort out these site slippage issues, some of them have invested a great deal of their time, for free, doing so. I think these problems are just a quirk of the Webplus software which the site is written in, but the bottom line is rewriting the whole website using different software would take weeks, and, unfortunately, it`s just not going to happen. We have The Ultimate In Secure Purchasing ! ! ! Always get an (itemised) invoice, and don`t pay up until you get one. Any business failing to leave a bill is thoroughly unprofessional, and possibly dishonest. I`m sure that the Inland Revenue would be interested to hear their activities. Incidentally if you purchase any parts from us and subsequently decide to employ an installer to fit them, any decent rigger should be impressed by the quality of the materials you have bought. If they try to tell you they are unsuitable in any way you may have well have picked the wrong installer, he knows less about aerials than he does about trying to sell you his stuff….. That said you may have struck lucky and chosen the right installer who might be giving you a pleasant surprise that there`s nothing wrong with your system and it`s just your TV is tuned to the wrong transmitter, or you`ve got too much signal and all you need is an attenuator (or to bypass your amplifier). Alternatively he may tell you that you just need your cable changing. So check all these things first before getting an aerial installer in (or ordering a load of stuff from us ! )……. Anyway, if you get some tradesman johnny trying to pull the wool over your eyes you phone us up and put the guy onto me (Justin Smith) or my staff and we`ll put them right there and then. Lastly, you`ll always get better service from an aerial installer if you have the job done in the summer, usually April to August/September. Not only will the better weather mean he`s likely to be in a better mood ( ! ) but he`s likely to have less work on as well. When we used to mend TVs it was the same, it was always slacker in the summer. The theory is the better weather and longer nights mean people watch less TV and so are less bothered about a crap picture ! On the other hand the worst time to get aerial work done is in November/December (particularly in December, just before Christmas) when demand is at peak levels and the weather is usually crap. Thus there may be delays getting the job done and the installer is bleedin` freezing so not quite as friendly and accommodating as he might otherwise be, so think on ! Every time your Gestapo lads walk up our road their dogs crap on the pavement. Don`t get me wrong, complaints/suggestions aren`t always correct or justified, but often they are. I can tell you for a fact that much of our customer feedback has directly resulted in changes to the way we operate, e.g. when a customer wanted to transport his aerial in its box across to Ireland on the ferry we put a table of box sizes on our site. Quite apart from anything else I`m of the view that if one customer takes the time to complain or suggest something there`s every chance that many others feel the same way but can`t be arsed to bother, and one can`t blame them for that, most people have busy lives these days. For instance, have you ever sat on a train felt a bit cramped and thought I`m sure there used to be more room than this ! Well you`re right, the cheeky gits are squeezing more seats into the same train carriage. Now I can`t believe I`m the only person who has felt a bit short of legroom on some of the trains these days but, apparently, hardly anyone has ever complained about it. Result ? They get away with it. Let the train companies, and, in fact, all companies, know what you think. They do actually want to know anyway ! * Albert Speer`s autobiography “Inside the Third Reich”, pages 265 and 297.